NEW DELHI: An advanced version of BRAHMOS land-attack supersonic cruise missile system has been successfully test fired today on the 27th of May 2016 at 1200 hrs in the Western Sector by the Indian Air Force (IAF). 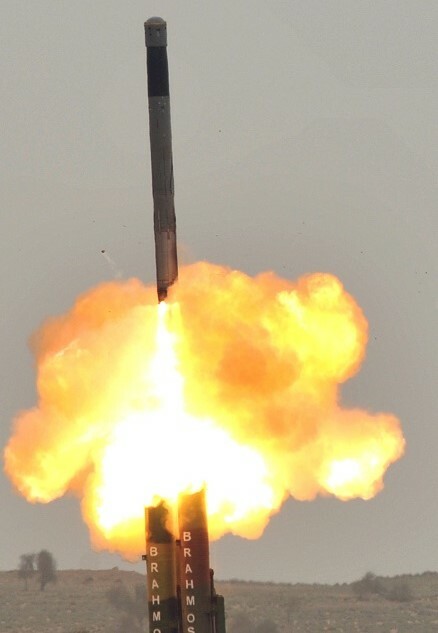 The unique BRAHMOS weapon system on numerous occasions has established its supremacy in the World of supersonic cruise missiles. The flight conducted today in one of the firing ranges in the Western Sector met its mission parameters in a copybook manner. Meeting all flight parameters, the formidable weapon successfully hit and annihilated the designated target, officials confirmed. "I congratulate the Indian Air Force for successfully accomplishing such a complex mission. BRAHMOS has proved its mettle once again as the best supersonic cruise missile system in the world," Shri Sudhir Mishra, CEO & MD of BrahMos Aerospace, said. DRDO Chief Dr S Christopher also congratulated the Indian Air Force, BrahMos team & DRDO scientists involved in today's successful mission. The weapon's accuracy in mountain warfare mode was recently re-established in a campaign conducted by the Indian Army in the Eastern Sector last year and repeated last month. This formidable missile system has empowered all three wings of the Indian armed forces with impeccable anti-ship & land attack capability. This model of JV has yielded results in shortest possible time and has been well recognised by the Indian as well as armed forces of many countries who are interested in acquiring this weapon complex.